If you're 42 weeks pregnant, it's time to learn what life is like with baby during his first week of life, and what to expect from your postpartum recovery. By the time she's born, your baby may be watermelon-size. You're expecting to give birth this week, but don't worry if your baby decides to stick around a little longer. Many first babies are late, and she'll be worth the wait—we promise! You're probably wondering what that stubborn little bugger could still possibly be doing in your womb! Most likely he's still happily moving about in your belly, and you should keep counting fetal kicks to be sure. He's also likely gaining weight, which means you may be giving birth to a bigger baby. As cozy as baby is, he can't stay inside forever. As he continues to grow, your healthcare provider will discuss options with you about inducing labor. Baby's not here yet? Sit tight. Only 5 percent of newborns arrive on their actual due dates, but over 80 percent are born within two weeks of it. 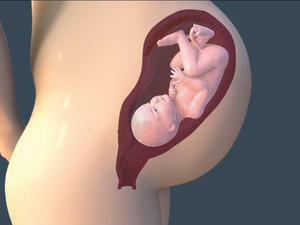 Most babies will be perfectly safe and healthy hanging out in your womb until 42 weeks. In fact, your baby isn't technically overdue until this week is over. After that, your doctor will likely want to consider inducing your labor by breaking your water or stripping your membranes, or with drugs (synthetic hormones, actually) that either bring on contractions or prepare your cervix. Waiting beyond your due date can give you lots of time for thinking and stressing about everything that could go wrong. Keep your mind occupied by reading up on baby care instead. Once baby does decide to make an appearance, you'll be busy, so you'll thank yourself if you already know how to give him his first bath, how to prevent cradle cap, and more. Is there a way to help my water break at home?